There’s nothing like soft, warm peaches that just melt in your mouth. 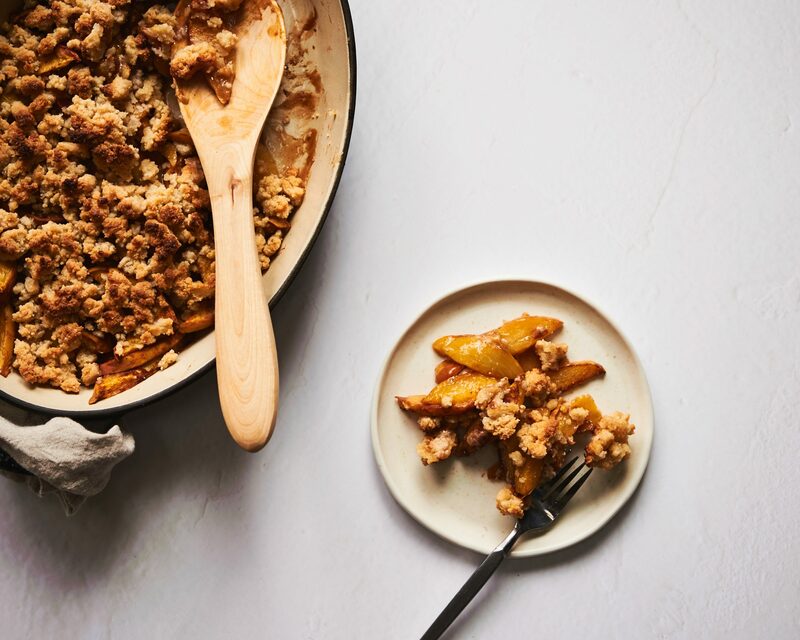 This paleo friendly peach cobbler is absolutely delicious as a sugar-free dessert but could even be used for breakfast. The good news is that this recipe is gluten free, grain free and sweetened with only maple syrup. Peaches are a good source of vitamin C, which is an important vitamin to help your cells fight off damage from free radicals. Peaches are also high in fiber so they support digestion and keep waste moving regularly, plus they contain many other vitamins and some minerals such as magnesium and potassium. Almond flour is one of our favorite alternatives to regular flour because it’s low in carbs and packed with protein and healthy fat that will help keep your blood sugar stable. Almond flour also contains vitamin E, magnesium, and fiber. Like vitamin C, vitamin E is another antioxidant that helps protect your cells from damage. Instead of using refined white flour or even other types of gluten free flour, almond flour is a nutrient dense alternative that can be used in gluten free cobbler, crumble and other baked goods. If you want to make this recipe vegan and dairy free, you can sub coconut oil in the topping instead of the butter. Slice peaches and mix together all of the ingredients for the filling. Spread the filling out in a baking dish. Make the topping in the food processor- pulse together the almond flour (or coconut oil), butter, maple syrup and sea salt to make a crumbly mixture. Spread the topping out over top of the peaches. Bake in oven for 25 minutes or until the peaches are soft and topping is lightly browned.